While I had at least marginally high hopes for Hali coming into this season, she did what many thought: namely nothing. Much like the late, great Malcolm, Hali embodied the “villager” archetype this season—a name, a face, but ultimately little more than a side character to the season’s larger narrative. A necessary role, but a boring one all the same. I will say, however, her exit interview made it sound like she was calling herself a goat. Although I found you bland on this season, Hali, I completely respect the self-awareness to know what, at least up until that point, you were. That’s something anyone should be able to appreciate. I wasn’t overjoyed to see Ozzy this season, but I feel similarly to him leaving now. An Ozzy-Cirie alliance is finally given to us, and it’s snatched away in the same episode? Sadness, dearest reader. Sadness. Perhaps saddest of all: Ozzy’s final archetype. The man, for the little we actually saw and heard from him, was clearly thought of as a legend, but his defeat at the hands of Tai on a challenge he was previously unbeaten at shows the times have changed and he’s no longer the challenge god people once saw him as. Though he’s only in his thirties, Ozzy is the mentor or the old hero/knight archetype, someone who was once revered but is past his prime. Hey, at least he broke the record for most number of days played! That’s a huge achievement, even if he should have ditched Tai and kept Sandra. Final note here: please don’t think I’m saying Ozzy isn’t an amazing physical competitor; he is. I’m merely saying, for the sake of this season’s story, Ozzy had to fall. Too bad. I was actually rooting for him this season. We’re down to eleven, my friends. In no particular order, let’s look at our remaining players and where their stories might be going! The only real pieces of content we’ve gotten with Andrea have seemed at least moderately negative. For one, Troyzan didn’t buy her placating answers back on Tavua, and now she seems deeply and personally offended that Zeke decided to go after her. For someone who was such a good sport of her last blindside, I expected more from Andrea. Survivor is a game, and I’ve always thought Andrea at least relatively competent at it. To be fair, she looked as though she was in the know until the Ozzy vote, but something tells me she’s not going to scramble back to power anytime soon. Although I’m unsure of her archetype just yet, I think her game is coming to a close. Maybe next week, maybe the one after, but most certainly not long after that. I think that tagline could very much sum up Aubry’s second time out. She’s never really been with the nominal “in-crowd” in any substantial way, yet she’s found a way to make it to the final eleven. She’s got a long way to make a second FTC appearance, and if she does, at this rate, she’s little more than a goat. Can Aubry and her scholarly archetype fact-check and use pure force of logic to maneuver to the bitter end? Sure. She’s a good player. Unfortunately, her edit seems flat if she was to be the victor. Maybe she makes the final eight, but maybe she’s next to go. Good luck, my friend. You look like you need it. While Cirie was understandably absent the first half of this season, let’s all be thankful she came roaring back this episode, and she did so in style. For someone who—in my mind—should have been as much of a no-brainer boot as Tony, Cirie doesn’t really seem to be drawing attention from non-Zeke players. Considering her track record, she should be beyond stoked. However, harkening back to the first episode and now her motivational and generational talk with Michaela, I stand by what I original saw: this woman is a tragic hero. We will root for her, and she may very well make it to the final episode. But like David Wright last season, Ozzy in South Pacific, Malcolm in Philippines, Wentworth in Cambodia, and many, many players before, Cirie will once more come up just short of her long-deserved crown. Side note for this wonderful player, she must have been very, very confident Zeke was going to go home if she threw a vote Sierra’s way to cause a little tension. While I currently don’t fully understand why Cirie thought this move necessary, she is a legend at the social and strategic parts of this game. I’m sure she had her reasons. Has There Been a Bigger Surprise? Seriously. Has there? 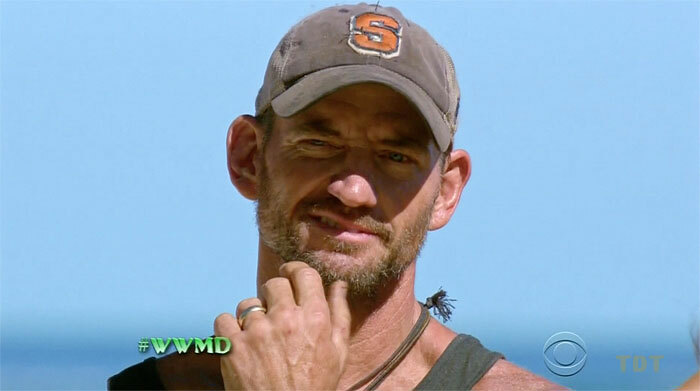 I know I had zero faith Brad Culpepper would come into this game and do anything but condescend women and patronize himself into a late, pre-Merge boot. While I appreciated his “genuine” martyrdom was called out in a confessional as him building a sort of brand (which I low-key totally agree with), it is impossible to ignore the heroic/hero archetype edit Brad’s receiving this season. I wonder, however, that the notion he’s building a “brand” might allude to people seeing him as fake. Obviously Cirie and Aubry both have validated Culpepper’s genuineness, but could Brad actually embody his wife and lose in the finale because people saw him as less than real? Probably not. Buckle up, dearest readers, Culpepper ain’t going anywhere soon. Is Debbie going to win this game? No. No, she is not. Is she doing substantially better than most probably thought? Oh, hell yes she is. Whether or not Debbie was really the driving force behind booting Ozzy, she was edited to look that way. Take a moment to let those words sink in. Debbie Wanner was edited as taking down Ozzy. Debbie, in many ways, is the “witch/warlock” archetype: a powerful—usually older and eccentric—figure who uses their powers to alter reality and cause mischief. People will underestimate her, and that will burn them in the long run. While I think it is safe to say Debbie’s doing a little more than causing mischief, she seems as destined as ever to fall because of her own hubris. Do I think that is imminent? Thankfully, no. Party on, Debbie. I’m so happy you’ve made it this far. Side note with Debbie: while, yes, she technically wasted her advantage (classic extra vote), I don’t necessarily blame her for doing so. 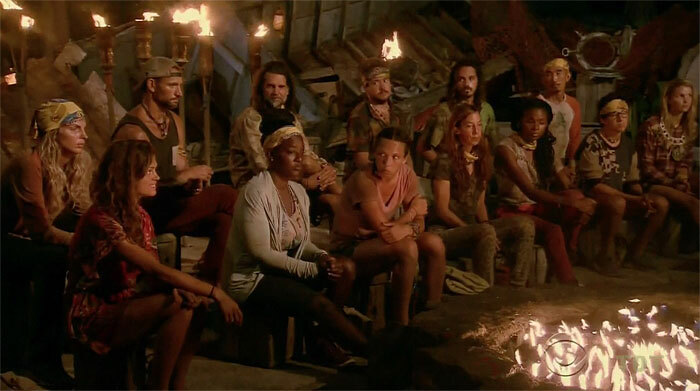 Assuming she hadn’t and Sarah had not flipped and Cirie had not used a throwaway vote on Sierra, Debbie’s group could have very well been in the minority. 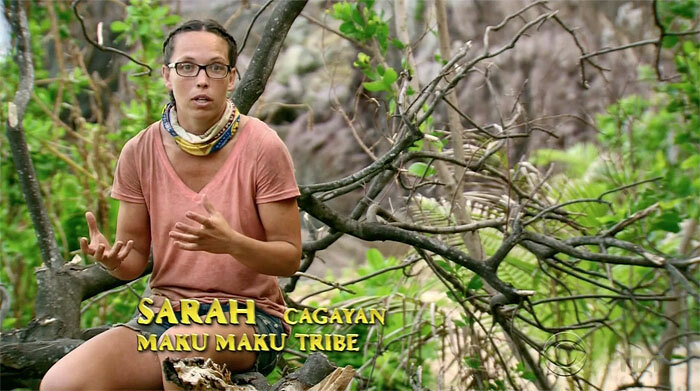 As it would’ve seemed all but certain Cirie was voting for Zeke and at least mildly probable Sarah would follow her alliance and do the same thing, I totally understand Debbie’s play. Of nothing else, she showed she’s loyal to her alliance much the same way Jeremy’s idol play for Stephen garnered him quite a bit of favor. A wasted advantage, maybe, but at least I see the logic. You done good enough, Debbie. Good enough. The Paradox for the Ages Settling In? I will not waste y’all’s time rehashing how paradoxical I find Michaela, yet this episode seemed like a solid stepping stone for her. 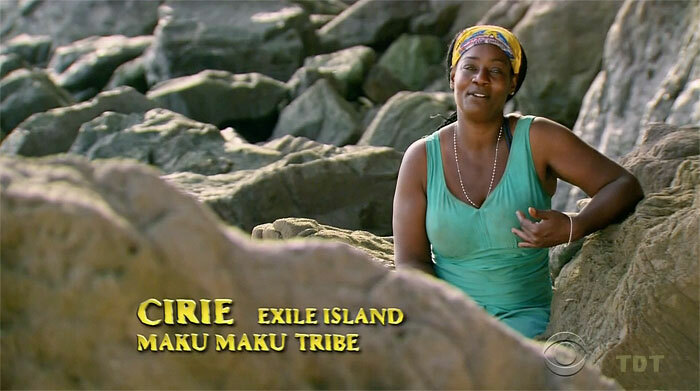 She resonated with Cirie on a deeper, out-of-game connection—both being African-American females—and as Cirie is an older generation, both in life and in the game, Michaela deferred to her guidance. This is a tremendously smart move for her, at least for longevity, for our blossoming antihero. 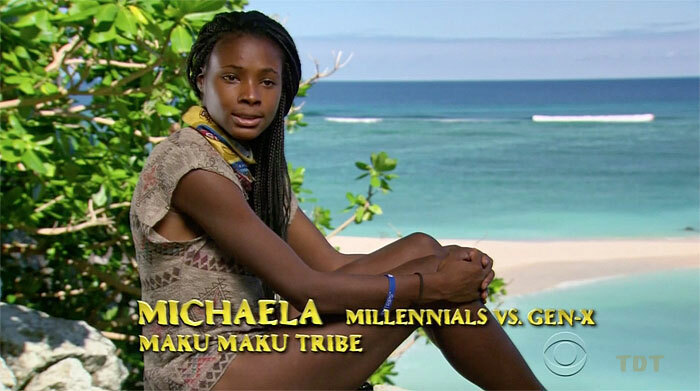 That being said, although Michaela may be gifted a few more days than she would have before thanks to Cirie’s mentoring, it seems unlikely Michaela could win unless she takes out her guide before the FTC. Possible, but even then, Michaela does not seem particularly liked by many on the possible-Jury save for maybe Hali. I’m rooting for her, but like most antiheroes, she’s a long shot to win. Let’s not kid ourselves: Sarah does not seem like the criminal she was hoping to be in episode one. I seem to think Sarah is just that decent of a person, and as such, she simply finds it hard to blindly backstab those close to her. 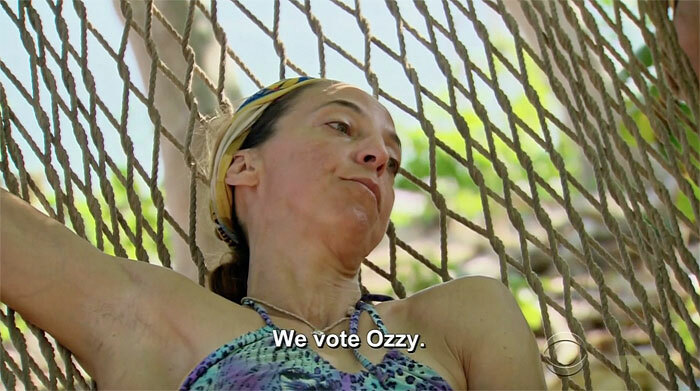 Yes, she voted out Ozzy, but I would hardly call her a swing vote as much as she didn’t want to go down with a sinking ship. That, to me, isn’t dastardly, merely the logical thing to do. Will Andrea likely get upset things aren’t going her way and maybe call-out Sarah? Sure. But calling herself a criminal… that seems a bit dramatic. So, then, what is my pregame winner’s pick’s archetype? Sarah is the “everywoman” archetype, one who, given the opportunity, many viewers probably identify with: someone who wants to make the utmost of their second time out, yet can’t quite get past their own moral tendencies. While I still don’t enjoy how she talked about Zeke, almost making the situation about how she felt, not him (although I’m fully aware this was not her intention), I think those clips were meant to show Sarah positively above anything else. 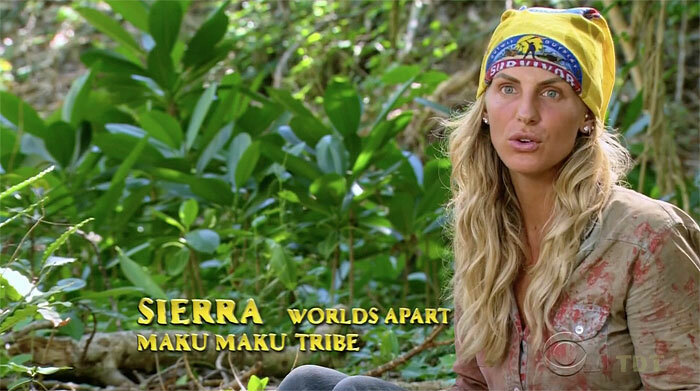 She is poised to make a deep run and the best shot we Survivor fans have to counter a Brad Culpepper victory, in my opinion (unless Cirie can weasel her way to the end by some miracle or Michaela’s social game turns the biggest one-eighty anyone’s ever seen). I’m not utterly convinced she is our winner, but she is one of the few who is definitely in the running. Say what you will and judge me as you may, even with her upped screen time this week, Sierra is one of the worst players—purely in my opinion—to ever get a second shot. Why? She seems unable to break away from previously formed bonds. Could one argue this just means she is loyal? That she is just that moral of a soul? Sure, and I’m sure there are many who may do such. But for someone who does have notable room to maneuver to immediately go and out Zeke’s plan to cut Andrea to Andrea…why? Yes, Sierra did successfully create in-fighting amidst those she was not directly aligned with, but why would she have not fed Zeke some line, lobbied to boot Andrea (who is a threat in all ways but the edit), and let Zeke think he was in the clear? Now she has one of the smartest players still left knowing he’s on the bottom, that he cannot trust her, and that he’s desperate. Tack on the fact exit interviews peg her as Brad’s drone, and I just do not respect her as a player. She is her same archetype from Worlds Apart: the lover, loyalty to a fault. She will not break away from her predetermined path for anything, not even if it means having ins with other people like Zeke who could, if nothing else, shield her in the votes to come. Will she likely make the final episode? Yes. Will she win? Ha…I can only hope not. 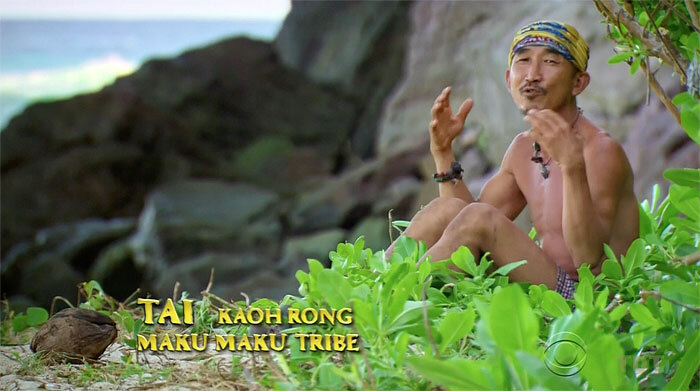 Hey, for everything Tai lacks in the game, the man is a rock when it comes to endurance challenges. I mean, he’s one of the oldest players out there and he outlasted a legend at his own game. Props to you, Tai. I may not think you the best of players, but you beat Ozzy in a challenge and are currently rocking two idols. While I don’t know your erratic archetype just yet, one thing is clear: you are a lot more dangerous than many are giving you credit for. That being said, are you our winner? See his last FTC performance and you tell me. Troy…the episode where you found that idol…I could see CBS playing those scenes over your winner’s montage come finale night. You seemed so genuine, so improved, and so grateful to just have another lifeline in this game. Since then, aside from your connection to Sarah, you’ve been painted as a lapdog for Brad. This is not a good look for you, my friend. Much like Tai, I don’t know what your archetype will ultimately be, largely because you’re the biggest wildcard to me left. You could flip the whole game around with your idol, take modest command, and waltz into an easy victory—and a part of me hopes you do. On the other hand, either Sarah or Brad (or maybe both) could drag you to the end as their favorite goat. Your fate is in your own hands. Make the most of it. 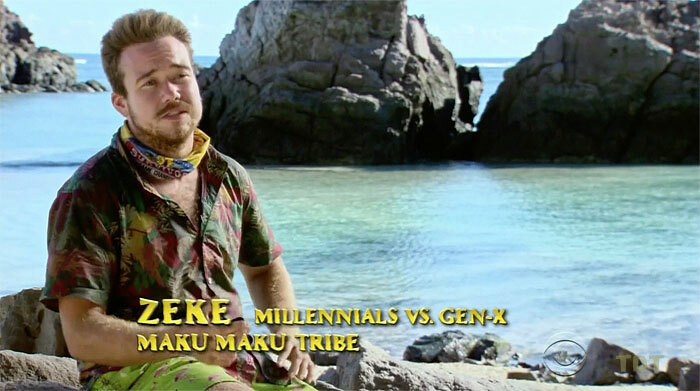 Much like MvGX, Zeke is a pilgrim, a wanderer, someone who defines themselves as what the game makes them, not how far they make it into the game. In both cases, Zeke has played as someone who loves the game and wants to honor it in every way he can by playing his heart out. You, dearest reader, can have no idea how much that resonates with me. I respect Zeke on so many levels, and while I will continue to root for him, his story arc is unfortunately over. He wanted to be a game changer, and considering he booted Sandra and became (albeit unfortunately) the first openly trans Survivor players (to my knowledge), I’d say he did that. No, Zeke is not our winner, largely due to his fatal flaw of going too hard too early. Still, do I think Zeke will get a third shot? Yes, yes I do. He’s earned it, and give him enough time to really sit back and consider his gameplay—all of his strengths and his weaknesses—this man could win. I’d love to watch as he does. I know there are many Sierra fans out there. I do not claim to understand you, but I know you exist and I respect you as one might respect me for thinking Sugar actually deserved to win Gabon (which I gather is an unpopular opinion). Regardless, allow me to take many of my hypotheticals (the worst of them, some might say) and produce the only feasible way, in my opinion, Sierra can win. 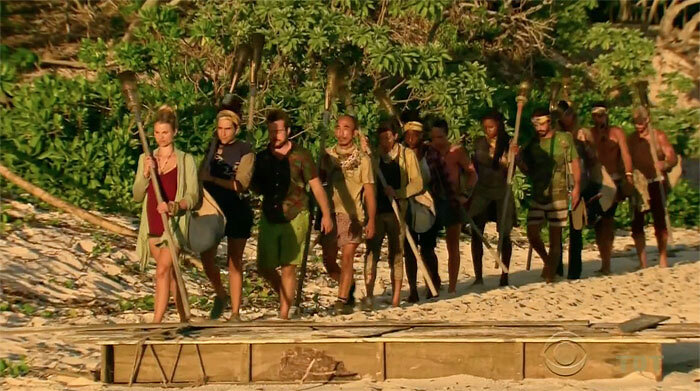 Let’s say the final six is something like: Troy, Brad, Sierra, Sarah, Cirie, and Tai (or maybe Debbie). 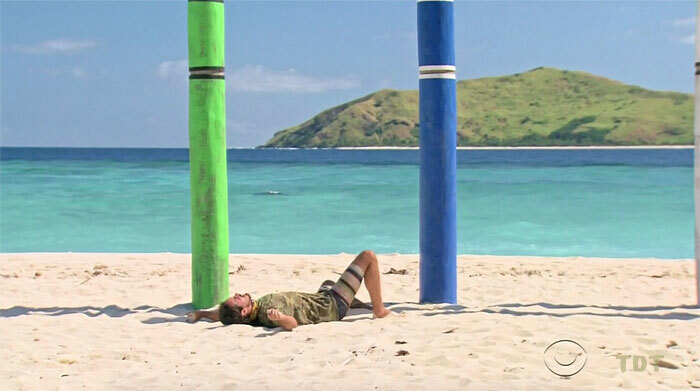 From here, even though it would have likely been some combination of Culpepper, Sarah, and Cirie ingenuity which eliminated all other threats in the game, all Sierra has to do is sit back and make one—literally one—move. This is how I would see this going down. At six, ditch Cirie, because, come on, she’s a legend and could probably skip her way to a landslide win at the end. At five, convince Sarah and Tai who is known for flipping or Debbie who still harbors at least mild animosity toward Culpepper, to turn on him and his beloved pet Troy. This is the only real move Sierra would ever have to sell in this scenario. At four, especially assuming Tai and Sierra are there, beat Sarah in immunity and boot her for being the last real player left. In a final three of Troyzan, Sierra, and Tai… how could Sierra screw that up? All she’d have to say is Troy took orders from Brad and then allow Tai to open his mouth. I still don’t think Sierra is our winner, but for those of you who side with me and think Sierra unworthy of all-star status, this hypothetical seems just a little too possible for comfort. If Sierra is indeed our champ, she’ll be right next to Fabio as far as “quality” of winners go. Of course, that’s just me. Okay, prediction time. To me, the boot is either going to be Andrea or Zeke as both seem to be at the end of their respective stories. The fan in me wants to see Zeke survive and Andrea go home, but the logical side of me says Zeke is far too deadly to keep around for anyone who sees him for what he is: a massive social and strategic threat. Sorry, Zeke.